Posted by Rita on August 26, 2013, updated January 26, 2016. Taking on the task of SEO, or search engine optimization, is daunting for many small business owners. As a marketing firm whose client list is comprised mostly of small businesses, we have come to understand that a lot of the apprehension is born out of unfamiliarity with what SEO is. 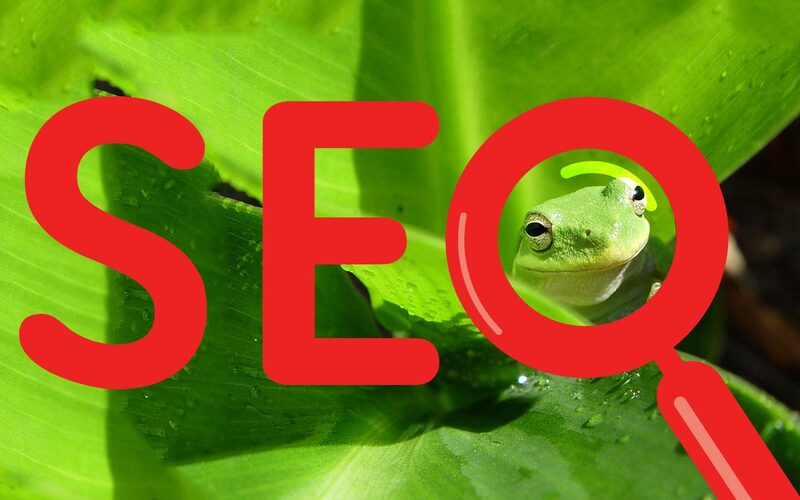 Thus, we have decided to break down SEO and explain it in layman’s terms as best we can. To begin, we will identify the Four Cornerstones of SEO: On-site SEO, Off-site SEO, SEM (search engine marketing), and SMM (social media marketing). We will deliver this explanation in bite-size chunks and devote this first post to On-site SEO. 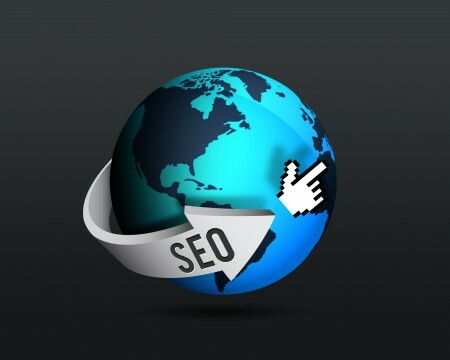 An important part of understanding SEO is understanding search engines themselves. In the most basic sense, search engines have automated robots called spiders that scour the internet retrieving content. They then store that content in an index which allows the users to look for words or combinations of words found in that index. SEO is the process of attracting the most qualified visitors to a website by securing high search engine results. Generally, a user will choose one of the top search results that appears after making a query. Businesses want to make sure that not only are their websites appearing in one of those top rankings, but that when a user visits their site it matches their original query. Since users are more likely to interact with the first site they find offering the products and/or services needed, those top ranking spots are optimal for any business. On-site SEO refers to the elements of a particular webpage that add to the overall optimization of that page. Having SEO elements on every page of a website ensures that when the search engine spiders “crawl” the page, the page is crawled correctly. Do not place important content in flash files, images, or other similar non-text formats. Do not use frames or i-frames. If your site has a lot of images and/or videos, provide relevant and descriptive text. Do not place links in images or flash – make sure clickable links are formatted in html. 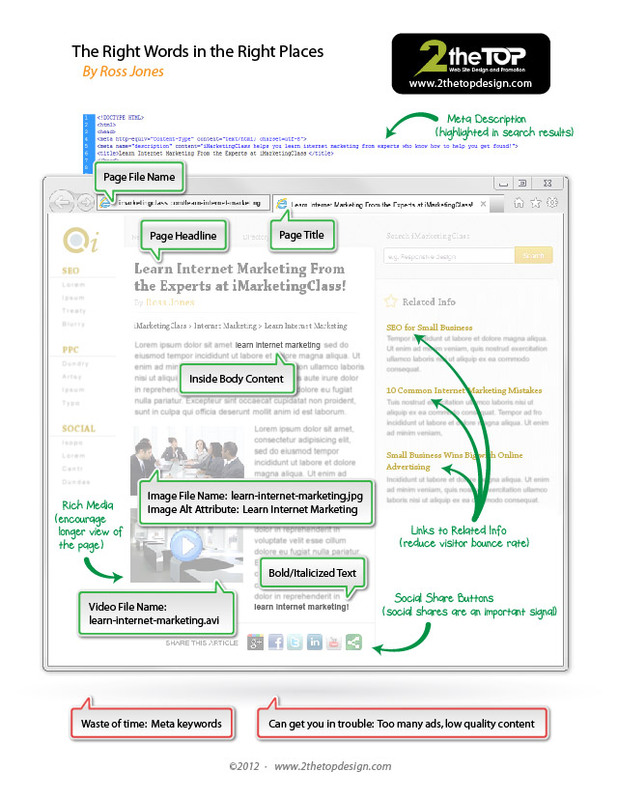 Create an html sitemap page on your site listing all of the important pages on your website. Make sure all of the important pages on the site are no further than 3 clicks away from the homepage. The URL of a webpage is an important factor in SEO ranking. URL’s should be as short as possible while describing the webpage well. This will make the URL SEO-friendly as well as user friendly, and a user friendly website will further add to SEO success. Both URL’s and page titles should be succinct and include primary key words. It is good practice to keep all page titles under 70 characters, and they should be relevant to the content of the page. Content needs to be well written. The quality of the content is far more important than the quantity. Be relevant by including words and phrases that may be used as keywords in search queries, and be creative! User-friendly, User-friendly, USER-FRIENDLY! The more people clicking on your page, the more people talking about you, the more people linking back to your page = SEO success. Make sure that when a user finds your page your site is performing properly and quickly! We at Treefrog Cinegraphix understand that you are busy running your business, so for assistance in designing an engaging and search engine optimized website, contact us.